IDF's Yoav Mordechai evades question when asked by PA news agency if Israel is responsible for collapse of Hamas's tunnels. 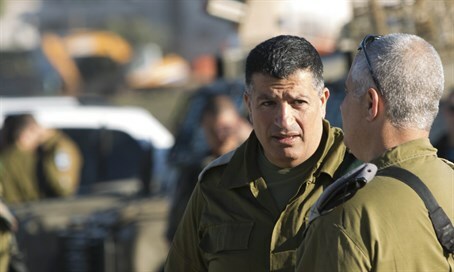 Major General Yoav Mordechai, the Coordinator of Government Activities in the Territories (COGAT), on Wednesday night gave an interview to the Palestinian Arab Ma’an news agency, in which he discussed Hamas’s terror tunnels. The interview took place in the wake of the recent collapses of several of Hamas’s tunnels. On Wednesday night, a tunnel collapsed in the Zeitoun neighborhood - the third time a tunnel collapsed in a week and the second time in as many days. During the interview, Mordechai warned that Hamas’s digging of tunnels leading into Israel will bring death and destruction to Gaza and its population, but said the tunnels do not pose a strategic threat to Israel. Hamas, Mordechai told Ma’an, is building "tunnels of death" at the expense of Gaza's residents by taking construction materials that enter Gaza and using them to build tunnels instead of rebuilding damaged homes. He also noted that during the past year and a half, Israel has allowed the entry of 3.5 million tons of construction materials into Gaza through the Kerem Shalom crossing. Israel continues to transfer humanitarian aid, goods and construction materials into Gaza, despite constant claims by Hamas that it is imposing a “siege” on the region. Mordechai suggested that Gazans stay away from the tunnels "especially after what happened a few days ago after the collapse of a tunnel." He was then asked whether Israel had a hand in the collapse of the tunnels, a question which he evaded and only answered with, "God knows." Hamas has been working hard to rebuild its network of tunnels - including attack tunnels into Israel and smuggling tunnels to and from Egypt - which were largely destroyed during the 2014 Operation Protective Edge. Following last week’s tunnel collapse, Hamas deputy leader Ismail Haniyeh finally publicly confirmed what had been well-known for a long time, that the group is rebuilding its tunnel infrastructure.